Amaro is the theme of this month’s cocktail collusion, a.k.a. Mixology Monday. Defined by our host Chuck Taggart of The Gumbo Pages, Amaro “refers to the bitter liqueurs usually drunk as an after-meal digestive, either alone (neat or on the rocks) or in some kind of mixed drink or cocktail.” If you’re not familiar with this type of liqueur you may take a moment to feel a bit lost. But don’t worry, after reading this and maybe a few MXMO blog posts you’ll feel like an expert. Those more familiar with Amaro may have Fernet Branca pop into your head right away, either with fond remembrance or fierce repulsion. The latter can rest easy; I didn’t mess with that one. 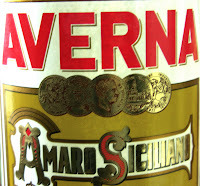 I chose Averna, an Italian liqueur that’s still made from the original 1868 recipe. It’s slightly bitter, has a pleasant thickness, and finishes quite sweet. 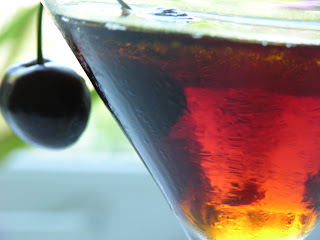 My inspiration for the drink comes from the Black Manhattan at the San Francisco speakeasy, Bourbon and Branch. Their cocktail is made with rye whiskey, Averna, and (according to the bartender) whiskey barrel bitters (I assumed those to be Fee Brothers.) Since first having the drink almost two years ago, I’ve been playing with the proportions, different whiskeys, and a recipe for my own bitters. And having just finished one in the middle of the afternoon, I feel quite good about the results. Add all ingredients to a cocktail glass/shaker and stir until ice cold (at least 30 seconds), strain into a chilled glass and garnish with a cherry. A quick note: I used Jim Beam Black, which I think is highly underrated and gets a bad rap from its brand. If you haven’t tasted it (with an open mind) you should. If you’ve tried it, don’t like it, but claim to like Maker’s Mark, then we should have a serious, sit-down chat. Now if only Trader Joe’s would strike a secret deal with ‘ol Jim and bottle it for their store at 8 bucks a bottle. 1. Combine all ingredients in a large jar (except for sugar and water). Store for two to three weeks in a cool dark place, shaking daily (every other day is fine too). 2. After a few weeks, when the mixture has infused, strain the solids through a cheesecloth, saving both solids and liquids. 3. Set liquid aside and combine the solids in a small saucepan with the three cups of water, letting it gently simmer for about 30 minutes. 4. Strain the mixture in cheesecloth, this time discarding the solids. 5. Combine the raw sugar with the water that was just infused with the spices, bring to a boil and stir until sugar dissolves. Remove from heat. Let cool to room temperature. 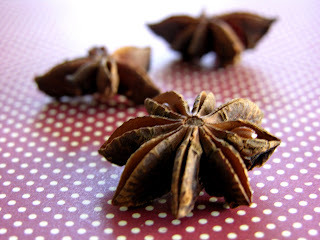 Your bitters will be ready to use in a few weeks, however, the longer they sit, the more complex and tasty they become. Six months is a good length of time for aging them, and one that won’t drive you completely nuts. When you’re ready to use them, strain the liquid (yes, again) through a cheesecloth, then through a coffee filter. You will notice a significant change in the clarity. Filtering your bitters will produce not only a more visually pleasing end product, but it will bring a lot of the “aging” or chemical processes to a halt. 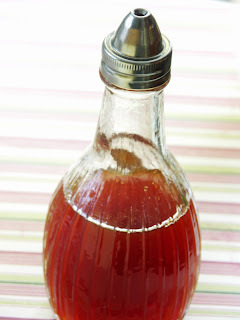 After a few months of aging, take half of your bitters, filter them, and funnel them into a glass bottle. Then make drinks like crazy. Put the other half back, way back, in the scary part of your pantry and forget about it. Remember it a year later, filter and taste. It’s the best of both worlds, if you’re impatient like I am.